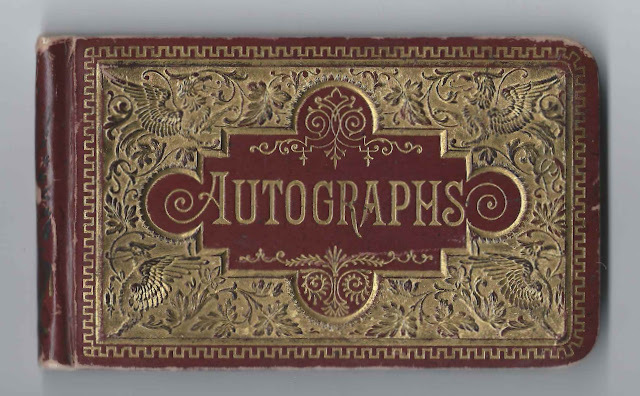 1888-1890 autograph album that belonged to a "Bell", who, judging from the autographs, likely lived at or near Alexandria, South Dakota. She may have been Isabella Bamber or Bell V. Bamber, daughter of English immigrants George and Sarah (Cardwell) Bamber. That Bell later married a Mr. Donahue. 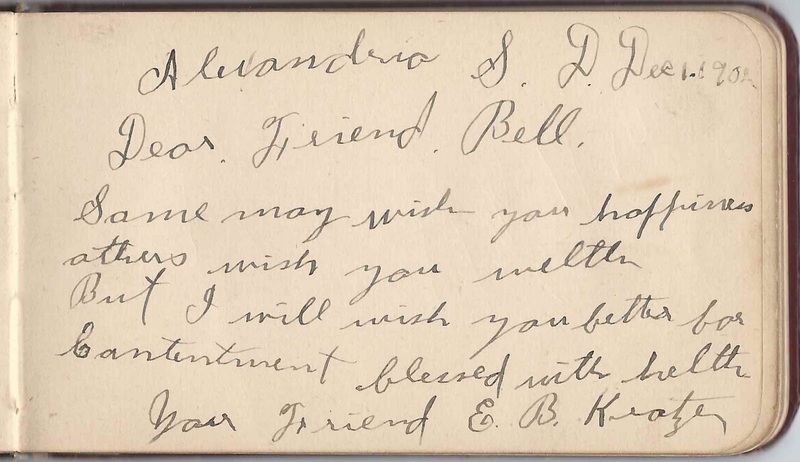 The album is approximately 5-1/4" x 3" and contains the sentiments of 7 of Bell's friends. An alphabetical surname list and an alphabetical list of the signers, together with any personal information they shared, appear at the end of this post. 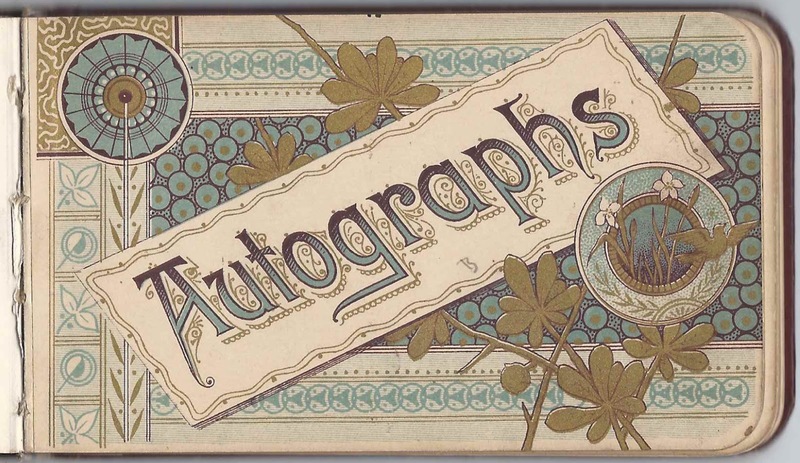 Because there are so few signed pages, I'll show them all, in page order. First, Julia Johnson signed a page at Alexandria, South Dakota, on January 10, 1888. 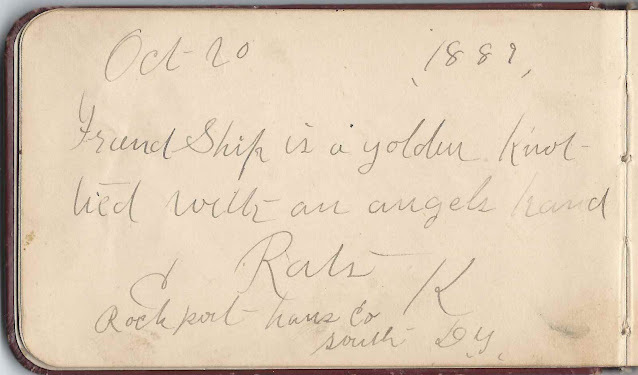 Tucked in her page is the calling card of a John Johnson, whose middle initial is hard to read, but could be an "O". And, interestingly, Julia Johnson had a brother John Olaf Johnson. 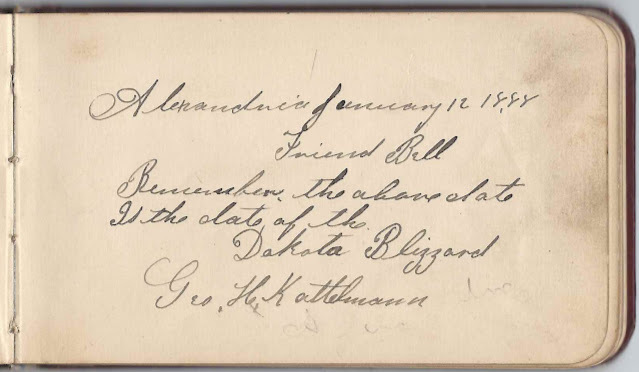 George H. Kattelmann signed a page at Alexandria, South Dakota, on January 12, 1888 and noted that it was the date of the "Dakota Blizzard", also known as the Schoolhouse Blizzard. 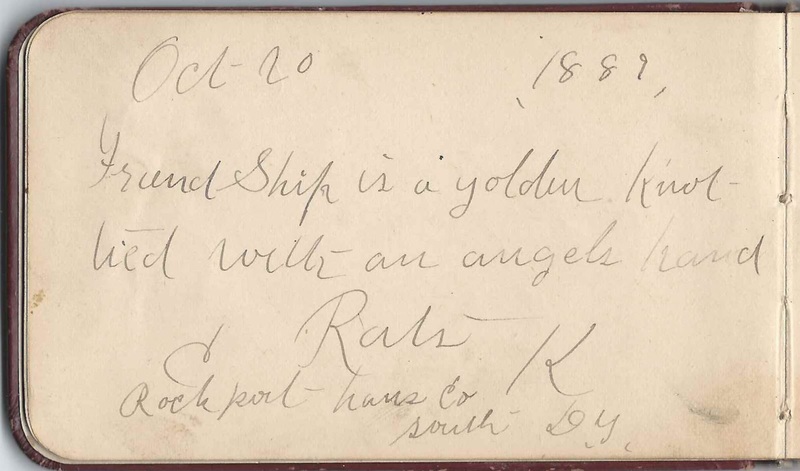 Someone by the name of Rats or Rals K, possibly also Kattelmann, signed a page at Rockport, South Dakota, on October 20, 1889, not long before South Dakota attained statehood. 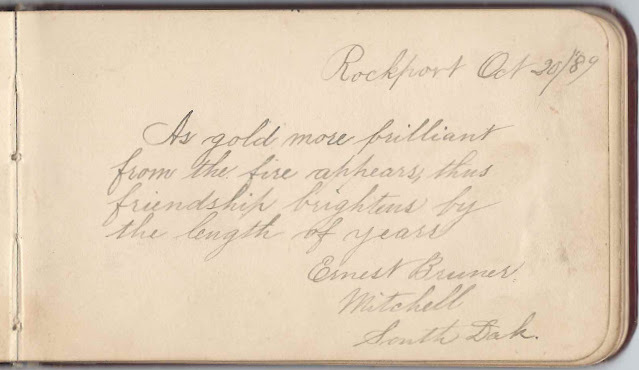 Ernest Bruner of Mitchell, South Dakota, signed a page at Rockport, South Dakota, on October 20, 1889, again not long before South Dakota attained statehood. If you have a different take on Ernest's surname, please leave a comment or contact me directly. Thanks! He may have been the Ernest Bruner of Plano, South Dakota who applied for a patent in 1896 for his invention of an ice-tire for bicycles. I believe the person who signed the page below was a C. Carlson. 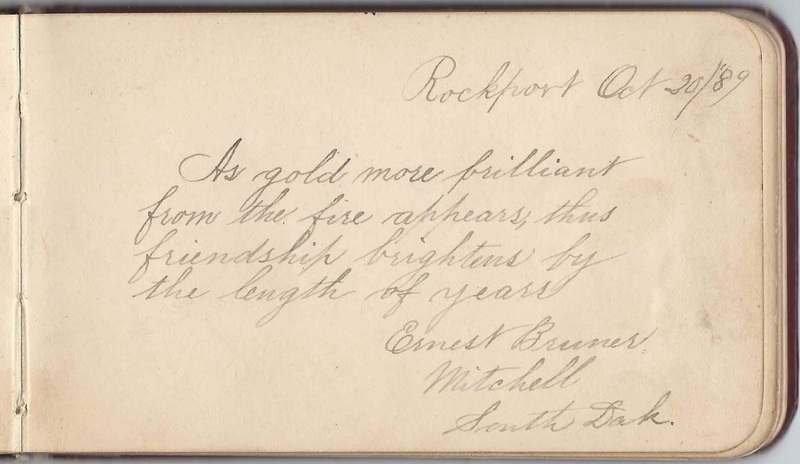 I believe the person who signed the page below at Alexandria, South Dakota, was E. B. Kratzer. If you have a theory as to the identity of the album owner "Bell", or information on any of the signers, please leave a comment or contact me directly. Thanks! List of signers: Note: Given names within a specific surname may not be in alphabetical order. 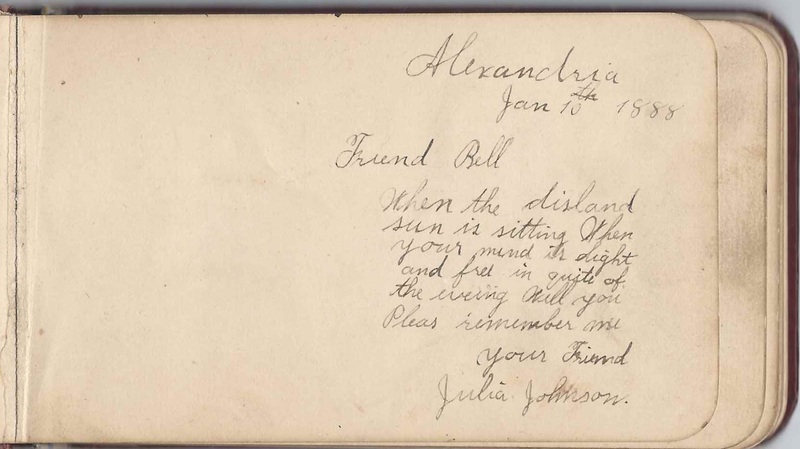 Julia Johnson, signed at Alexandria [no state written, but presumably Alexandria, South Dakota], on January 10, 1888. 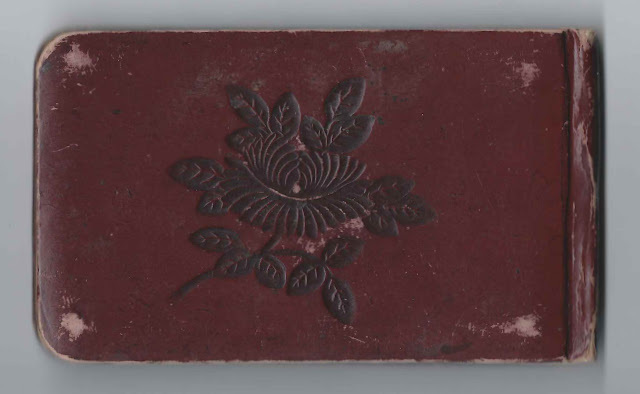 Perhaps the Julia Johnson who had a brother John Olaf Johnson, who may have been the owner of a calling card found in the album. 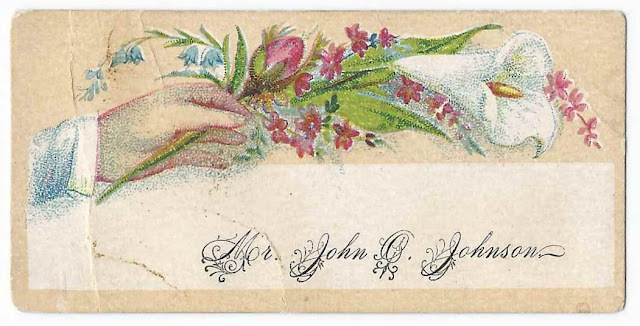 Calling card of Mr. John Johnson; middle initial might be O or P or C or ? 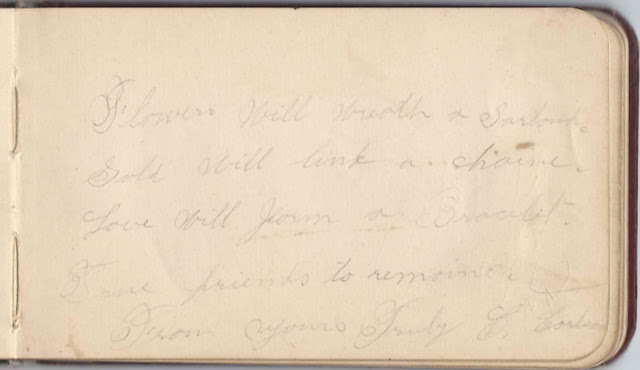 Possibly John Olaf Johnson, sister of signer Julia Johnson. George H. Kattelmann, signed at Alexandria [no state written, but presumably Alexandria, South Dakota], on January 12, 1888; mentions that that date was the day of the "Dakota Blizzard"